As usual, we started the photography session with the “bare” baby looks. 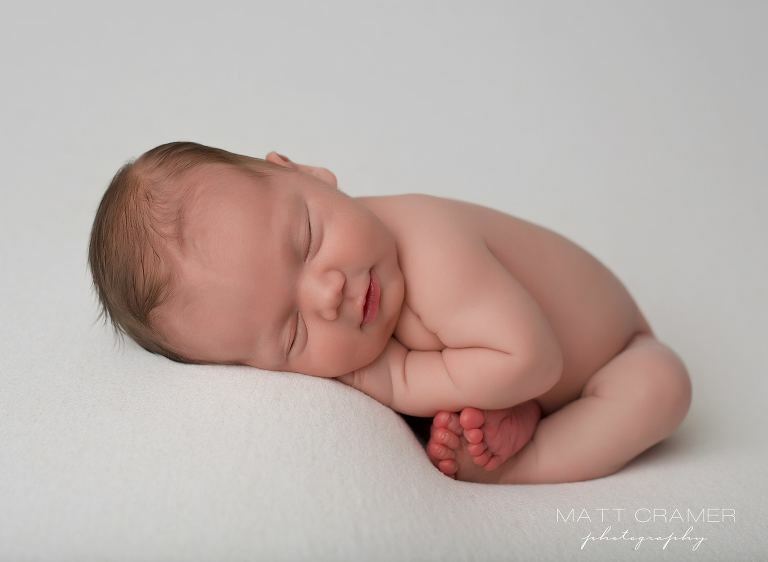 For these shots, baby is sleeping peacefully on a simple, clean fabric. I (Jess) gently guide baby into different poses. These shots really emphasize baby’s pure skin and are beautiful reminders of just how tiny your sweet newborn was! We caught an adorable baby smirk here! 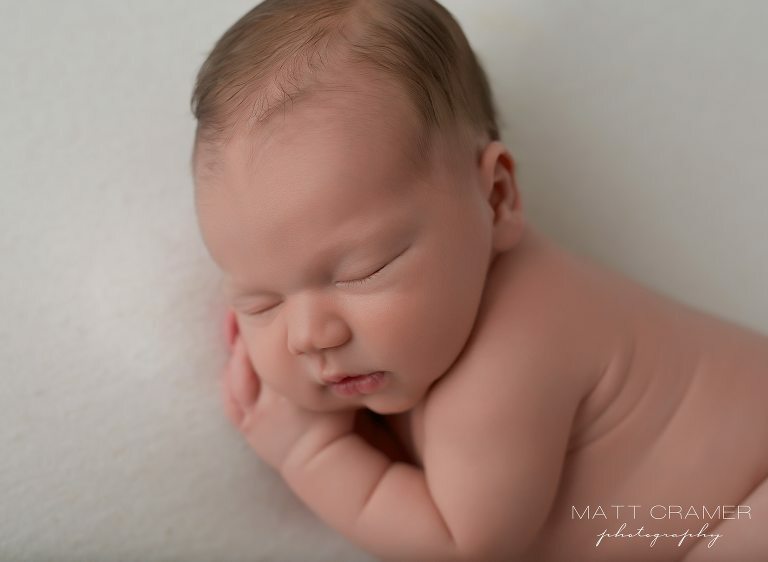 We think this image is the ultimate “peaceful, sleepy baby” shot! The light and airy feel and his relaxed face is just so sweet. One of my favorite images in the entire session! 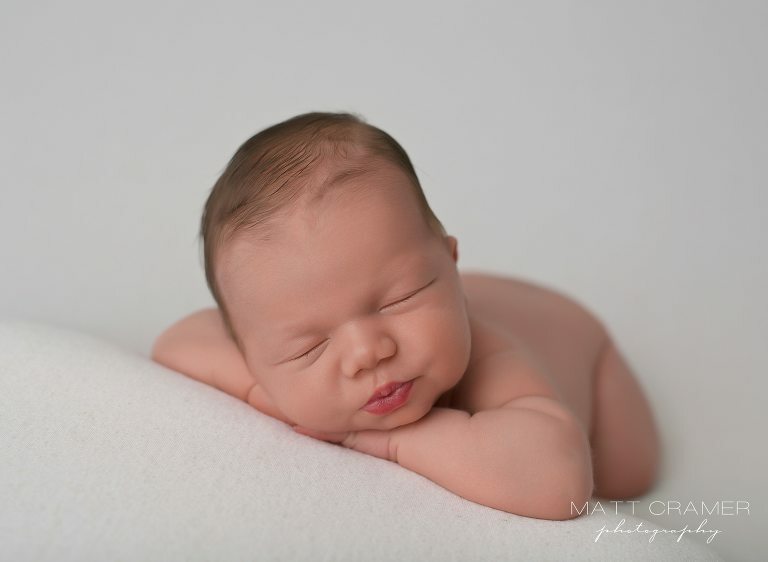 This pose is usually more challenging and we don’t always get it in every session, but he just kept snoozing away. Our Los Angeles newborn photography shoots are completely baby led. This means that your baby will dictate which poses we capture. If baby loves a pose and continues to sleep peacefully, then great. We can capture many different angles and perspectives. If there is a pose that baby does not like or is not perfectly comfortable in, then we move on. Parents please take this into consideration when deciding on your newborn baby photographer. 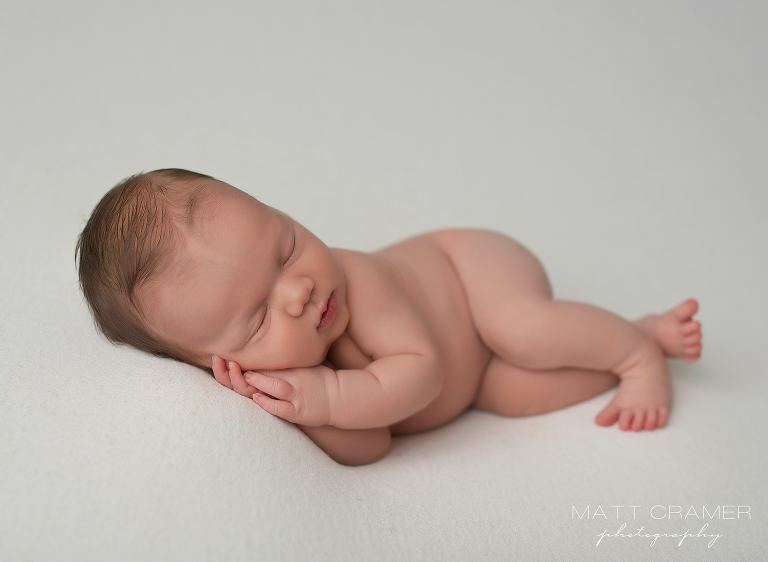 Remember this is someone that should be HIGHLY experienced in posing newborns safely. The kissiset lips- is that even a word?! Ha ha. He’s just perfect and seems like he was totally ready for this close up shot! Adding a soft handmade knit angora wrap to this pose gives it such a cozy feeling. After the fabric shots, we settled baby into a different version of bare baby shots. Look at this smile! Swoon! Being held up in Daddy’s hands was a shot requested by Mom and Dad. Again, this is another pose that can be quite a challenge. This one shot alone takes an average of 30 minutes to pose and shoot. Baby has to also be incredibly sleepy. When this shot is requested, we always try our best but do not guarantee it. Every baby is so different; some are more sensitive, less sleepy and really preferred being swaddled up nice and cozy. So for newborns like that, this shot is not likely-but we always give it our best effort! Once we captured Dad’s hands, we called Mom over. “We need your hands please!”, lol. She was so cute and so surprised, “My hands?! Oh really, are you sure?”. I’ll remember that forever. Her sweet boy instantly smiled once she gently cupped his head with her hands. It was definitely a moment. Since he was still sleeping so well, we were also able to capture some pure baby shots. Our blue themed set up was also a special request from Mom and Dad. We loved the way it came out against our antiqued blue wood flooring, too. Details are the extra pieces you need for story telling, and Matt never leaves them out. From the darker blue look, we switched gears and went to a lighter blue/gray palette. Easily our most requested set up and I’m pretty sure we do a version of this set up in almost every single Los Angeles newborn boy photography session. Gray and blue are a beautiful combo! During our photo shoots we always try to include shots with a textured background for more variety, too! Who can resist a little teddy bear!? Our handmade knit angora teddy bear hats are a top favorite in our Los Angeles newborn baby photography studio! I think we have this hat in about six different colors now! We finish our sessions with parent and baby shots if that package is chosen. Oh sweet mama, how you waited for your perfect boy. Mommy and baby images tug at my heart strings every time. The sense of love and closeness in these images are priceless! Back in Daddy’s arms and what a wonderful place to be! Five years from now, Dad will look back at these images and find it very hard to believe that his boy once fit inside the bend of his arm. Their first professional portrait as a family of three! Beautiful inside and out! Blessed beyond measure! It was so wonderful meeting this beautiful family!